Get a Residential Solar Quote in Davis, California. If you own a home in Davis, California, you are well qualified for residential solar. Your PG&E electrical rates are among the largest in the nation. A generous federal tax credit, policies set by the California Public Utilities Commission regarding net energy metering, and an abundance of California sun make Davis a fantastic place for homeowners save with solar. Compare Davis's sun to the rest of the nation. Shout out to bestplaces.net for the weather data. Home Solar is Great in West Sacramento, California. Good news, West Sacramento. You are definitely qualified for residential solar. Your PG&E rates are among the highest electricity rates in the nation. A nice 30% federal tax credit, state policies on net energy metering, and lots of California sun make West Sacramento a fantastic place for homeowners save with solar. Compare West Sac's sun to the rest of the nation. Solar Energy is a No-brainer in Granite Bay, California. If you live in Granite Bay you have very high PG&E electricity rates. There is good news, though. A 30% federal tax credit, net energy metering, and copious amounts of sun make Granite Bay, California a great place for homeowners save with solar. Compared to the rest of America, and even most of its neighbor cities, Granite Bay has more days of sunshine! Solar For Your Home is a Natural Fit in Lincoln, California. These high rates along with federal tax credits, net metering, and an abundance of sun make Lincoln, California a fantastic place for homeowners save with solar. Compared to the rest of America, Lincoln has tons more days of sunshine! Solar Energy Works Well in Loomis, California. These high rates along with federal tax credits, net metering, and an abundance of sun make Loomis, California a fantastic place for homeowners save with solar. Compare the sunshine Loomis gets to the rest of the United States! Solar rocks in Rocklin, California. These high rates along with federal tax credits, net metering, and plenty of sunshine make Rocklin an ideal location for homeowners save with solar. Rocklin gets 50 more days of sunshine than the rest of the USA! Does it Make Sense to Go Solar Everywhere in California? If you've lived in California for some time, you've probably come across the acronyms for its three largest investor owned utilities (IOUs). IOUs are private utility providers beholden to their shareholders. Because of this relationship, these utilities, like any for profit business, put an emphasis on getting the most out of their customers (called ratepayers). They are the most expensive utilities in California, and typically 50% or more higher than the national average. They are regulated by the California Public Utilities Commission. Publicly owned utilities (POUs) are non-profit utilities owned by municipalities, irrigation districts, or city departments. Their rates are far less than those of IOUs. Southern California Edison (SCE), San Diego Gas & Electric (SDG&E), and Pacific Gas and Electric (PG&E) make up California's big three. If you live in an area where the only choice you have for power is one of the big three, congratulations, you are very likely a good candidate for solar. You are a good candidate because your rates are high and these utilities (thanks to the California state law and the CPUC) offer net energy metering. Net metering is simply the system that tracks the surplus electricity your solar panels produce as stored energy credits to use at night or on cloudy days. If you don't live in one of the big three's territories, congratulations, your rates are relatively low compared to your big three neighbors. But that doesn't mean solar might not make sense for you. While many of the incentives, such as cash rebates, are drying up for these POUs, some are still available. Call or check your local utility's website for solar rebate information. At the same time, a lot of these utilities' rates continue to rise while the price of solar decreases. It is making more and more sense to go solar even with POUs that don't offer rebates. One more thing. Some utilities don't offer net metering at all or only at certain times. You'll need to check with your POU for when they'll open solar back up. The beginning of the calendar year is usually a safe bet. 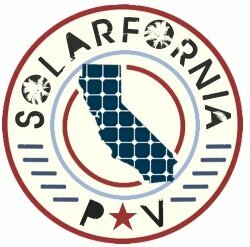 If you are unsure about your utility and if you'd like to get some answers about whether or not solar would be a good fit for you and yours, please contact SOLARFORNIA. It'd be our pleasure to look into it for you. Now let me welcome everybody to the wild wild west. A state that is untouchable like Elliot Ness. When it comes to solar California is best. Don't believe me? Let's put it to the test. I could drop the mic right there. The numbers on the chart above are insane. California is absolutely killing it in solar. But here's an article that was published almost immediately after I put this one up: California is Making So Much Solar Energy The Rest of the Country Looks Like a Joke. The article coincidentally posted on mic.com. The reasons for California's solar dominance goes well beyond it being the most populous state. It's copious amounts of sunshine helps to some degree. But its policies and its independent and forward thinking people are the most important contributors to the Golden State's solar success. California currently has a mandate to reach 50% renewable sources of energy by 2030. You can help us reach that goal and save on your electric bill right now. Click the button below to get started.